If you have Unifi network gear you also need the Unifi Controller. And it is best to keep the controller running 24/7, so where are you going to install it? 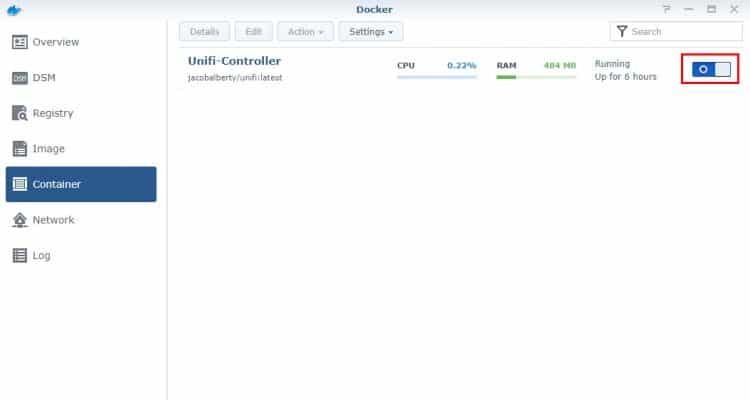 If you have a Synology Nas then you could use a Docker Image to run the Unifi Controller. In this article, I will guide you through the installation of Docker and Unifi on your Synology in 5 minutes. 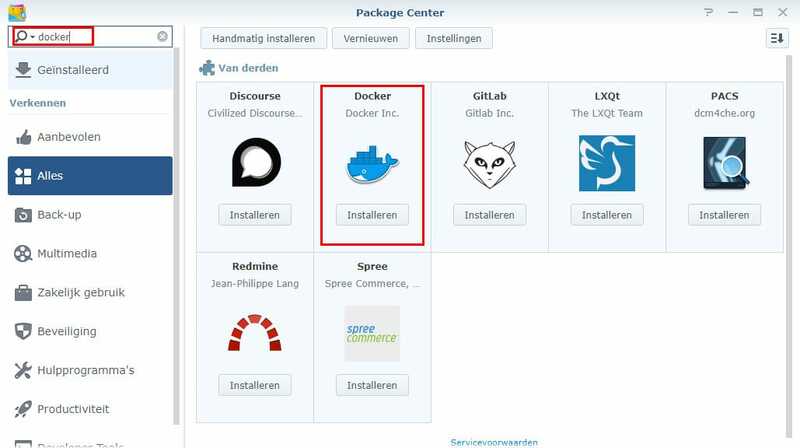 On the website of Synology, you will find information about the add-on Docker and which models support it. Check if your model is listed there under the applied model’s section. First, we are going to install Docker. Docker allows you to run applications in containers. 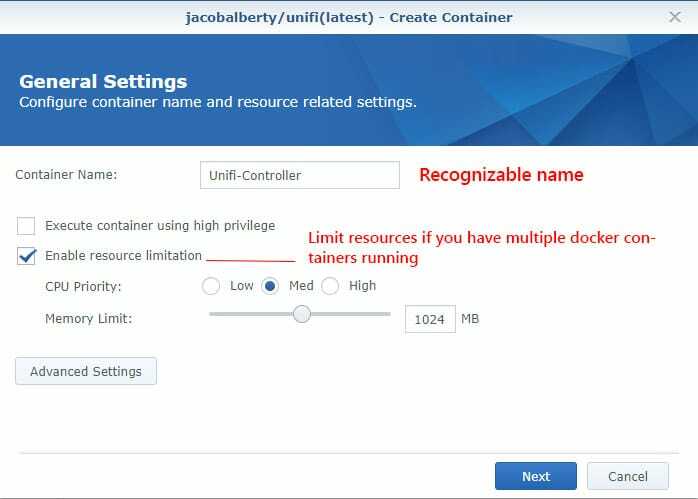 The advantage of containers is that a developer can create a package, in this case, the Unifi Controller, with all the parts it needs (like Java and MongoDB). Leaving the user with only downloading and starting the image up inside the container. This way other application on the same machine won’t be harmed. Login to your Synology Nas with an admin user. Installing the Unifi Controller is just a few mouse clicks. 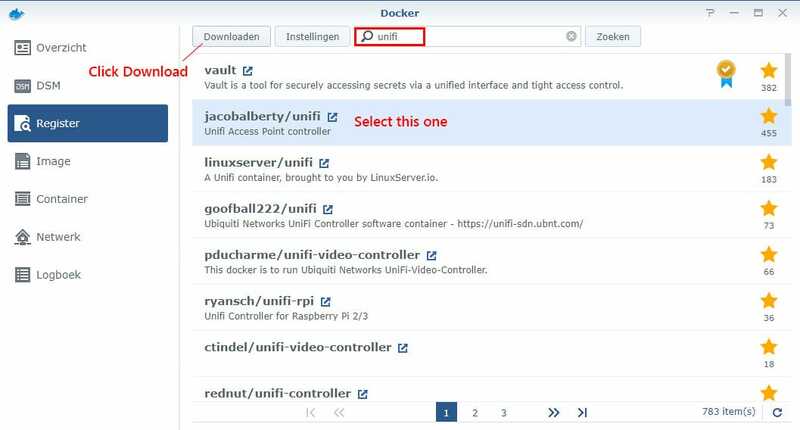 We are going to download the Unifi Controller image (700Mb) and configure the Docker Container for it. Docker starts up after you installed it. Go the register on the left side and search for Unifi. After you clicked on Launch, the container configuration wizard will start. 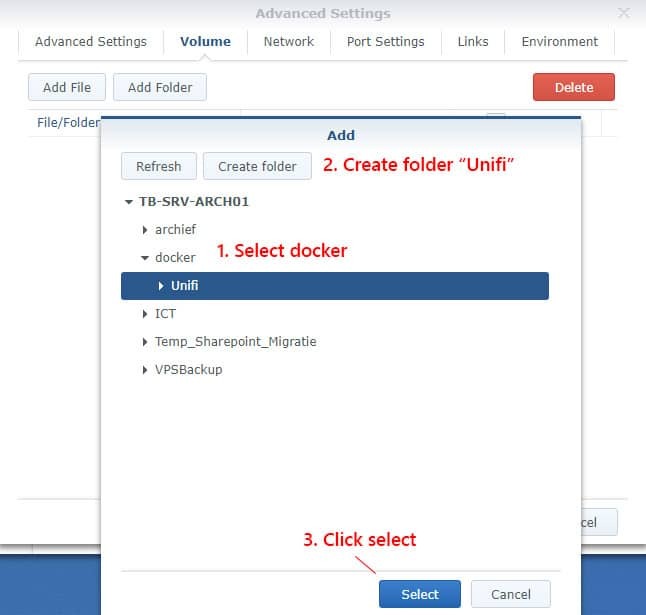 We need to change some settings so we can reach the Unifi Controller from another computer (then only from the Synology), store the files somewhere and limit the resources. Give the Container a name, like Unifi-Controller. Something you will recognize later. Enable resource limitation, this way the Unifi Controller can’t use all the resources of the Synology. This is really recommended if you are running more applications on your NAS. Click on the tab Volume. We need to map the file storage of the Docker to the disk of the Synology. 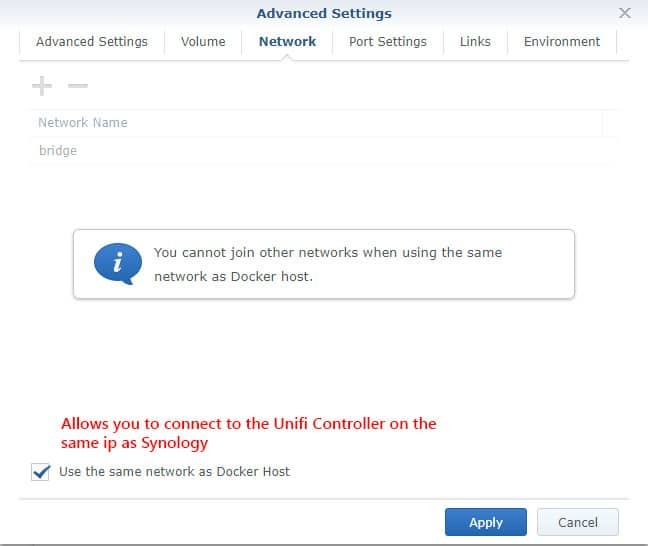 Click on the network tab and select Use the same network as Docker Host. This way we can reach the Unifi Controller on the same IP Address as our Synology NAS. Click on the last tab, Environment. Click on Next and Apply again. The Unifi Controller will now start and is accessible on your Synology address on port 8443. So if you can open your NAS on https://192.168.1.2 then you can find the Unifi Controller on https://192.168.1.2:8443. Make sure you put https in front of it. Here you will see the Enable Firewall is turned on. 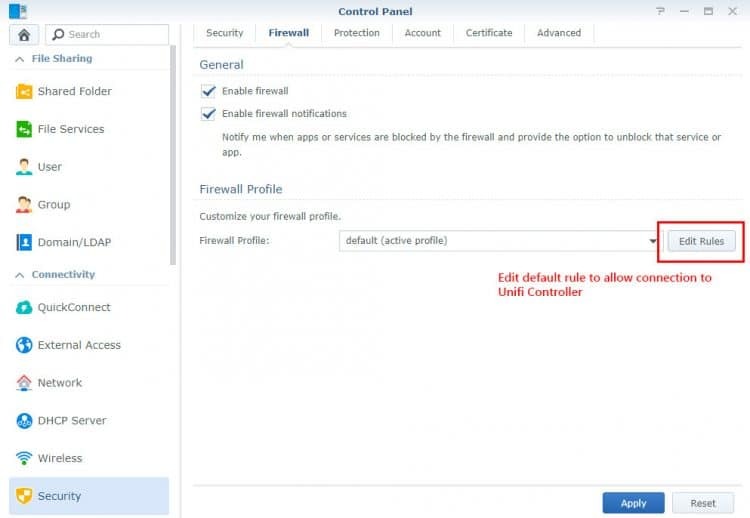 Below that you will find the Firewall Profile. Click on Edit Rules to open the ports for the Unifi Controller. You should now be able to access the Unifi Controller. 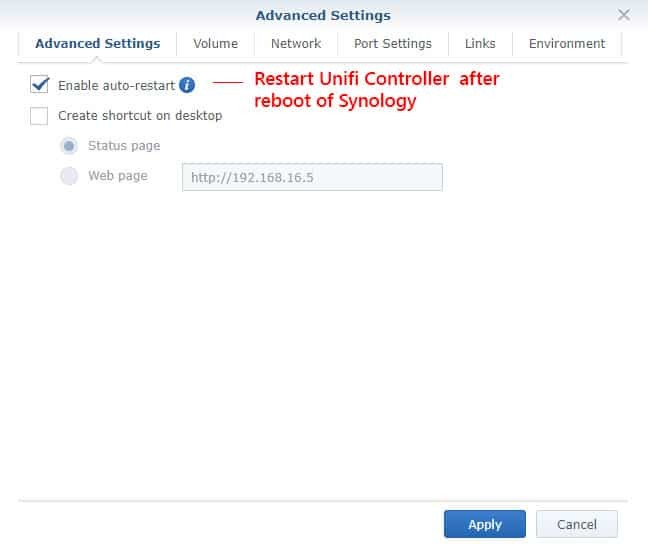 If this controller is still not accessible then it might be necessary to restart your Synology NAS. The Unifi Controller will start automatically after the reboot. Updating the Unifi Controller on the Synology is a little bit different compared to a Linux/Windows/Rasberry Pi installation. You can’t just download the latest version and run the installer inside the Docker container. There is no auto-update feature either, so when a new version comes out, you will need to download a new version of the Docker Unifi Image. Tip: subscribe to my email list in the sidebar to receive a notification when a new version is available! Before you start with updating you should always make and download a backup of your Unifi Controller. Login to the controller an select Maintenance. Scroll down to Backup and download the backup file. Select the jacobalbert/unifi and click download. You can now log in again on your Unifi Controller. If you Synology doesn’t support Docker or you are planning to buy a new Synology NAS, then make sure you check the Docker Add-On page at the Synology website to see if it support Docker. For home networks, the Synology NAS DS218+ is a good and affordable choice. It will cost around $ 300 on Amazon for the diskless version. Don’t be tempted to go for the cheaper version, they don’t support Docker. A cheaper alternative to run the Unifi Controller is a Rasberry Pi or the Unifi Cloud Key. The Cloud key cost only a third on Amazon of the Synology NAS and you only need to power it up to use the controller software. If you have any questions just drop a comment below. Make sure you sign up for the newsletter to stay up-to-date with the Unifi Controller software. If you are having problems with access to the Docker container network, check the Ports tab of the container. Make sure the value in Local port matches the value in Container port. 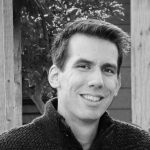 If the Local port is set to AUTO, Docker automatically assigns its own port, not the Container port. My install now works without setting up other services or workarounds. Workaround with Virtual Machine Manager works very well ! 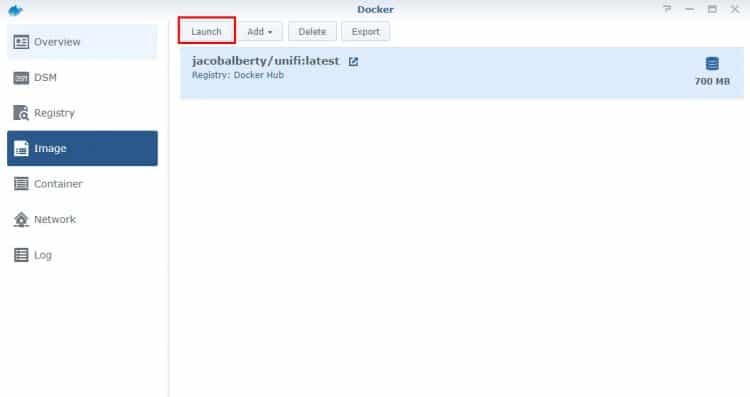 Hi I am novice at using docker ….. I followed your tutorail and installed the Unifi Video sorfware. I also installed the latest Java. The Unifi Software seems to be running stably – although the CPU usage fluctuates a bit. (when I first installed without Java it crashed every minute). How do I access the NV software do I use the Unifi discovery tool from my main pc ………. ??? Also do I need to install some form of cloud key in another docker container??? I am a little confused can you help. I found a workaround to install the Unifi docker with the original ports. I had the feeling the DDSM (Docker DSM) was blocking/using all ports. So 1st I tried install Docker in DDSM. This is not possible. 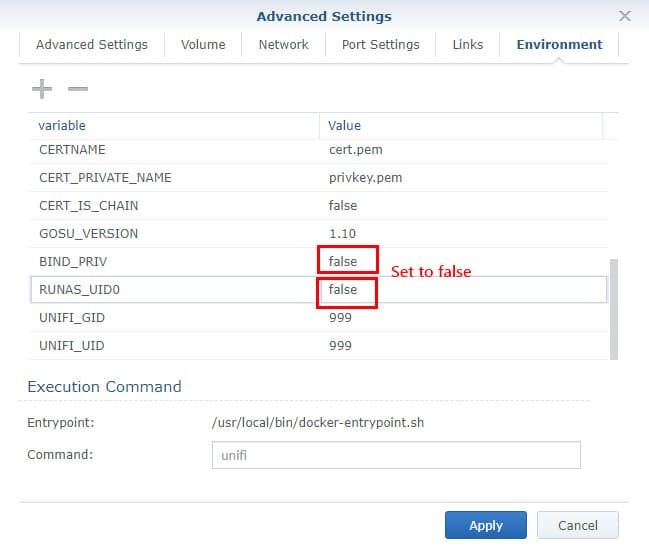 Synology does not accept a Docker inside a Docker. I hope this workaround is useful for other users. I think my issues are more or less the same as the issues of Frank Mauritz, David and Giuseppe A. Continisio. 1st I installed according to your manual, using the “Use the same network as Docker Host” option. Doing this, the Docker crashes within 1 minute, with the error port 8443 is not reachable. 2nd I installed using not tagging the “Use the same network as Docker Host”. When I go to the tab with the port settings, I change all ports to the standard ports. Docker reports all 6 ports “value already existing”. The docker is not starting. I tried to install the docker according to your manual on my DS1515+ / DS6.2.1 / 16GB, but the docker crashes within 1 minute every time I try to start it. Do you have any clue where I could search to solve this? I think re-installing docker should fix this. If you search on the error you will notice a few others that have the same problem. A few of them solved it with re-installing Docker. Make sure everything is up-to-date. Hi, I’ve been running UniFi in Docker on my Synology for a few months now and have already been through a few upgrade cycles. Currently running 5.10.19. Tried upgrading to 5.10.20 tonight using “latest”. Everything appears to go ok however UniFi loads as the old version. Any ideas? One other thing, when I stop the container and select Action > Clear, the container disappears. I need to close the Docker window and open it again for the container to be visable again. Everything works OK but I run into a problem, I can not adopt any device in any SITE created in my controler. but the device never seems to be in the controller for adoption. What URL should I use in a Controller of this type? The address you are using won’t work. synology.me address is a online address, the Unifi needs a local address. Try to use the ip address of the Synology instead. The installation was done without any trouble. I downloaded a site saved on another controller. I can import it to the nas. When I reached the webpage of the controller, I got to enter a login and a password : it entered the one I use on my “old” controller, but it doesn’t work. I click to rest the password : impossible to do it. I followed step-by-step your guide, and I was sure, everything was ok. Unfortunately after starting the process I was not able to reach the site on https://syno_ip:8443.
and this after every 14 seconds. In the Docker Container I can observe how the cpu and ram jumps up and down. I don’t know how to treat the port error. My Docker runs only this container. I hope you have an idea. 1. why should be those 2 parameters set to false? 2. I need to chage the communication ports, as the 8443 port is already used by different application, is it possible to change it somehow within the docker? RUNAS_UID0 is set to false so the image will run as a special unifi user. Otherwise, it will run as root. The BIND_PRIV variable can be used to bind port below the 1024. But on some docker filesystems, this may not work. To change the ports, you should be able to change this in the system.properties file. You will find it in the File Station/docker/Unifi/data. 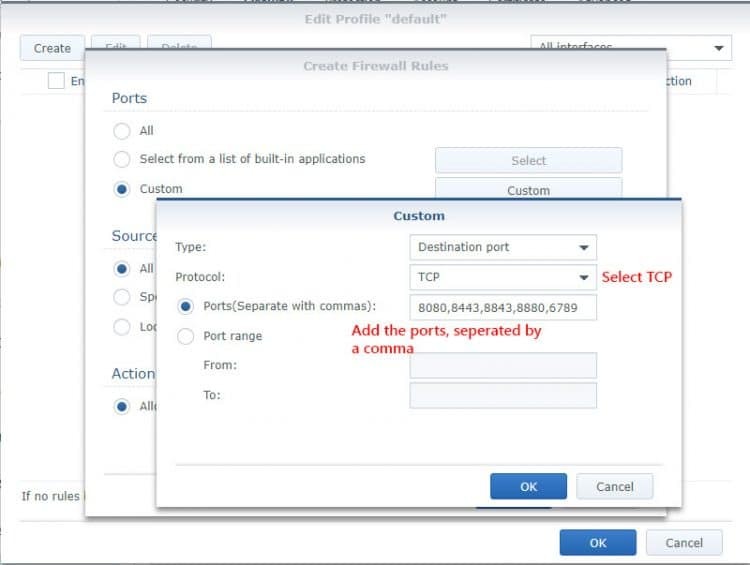 More info about changing ports here. I wrote the path /Unifi and it did not save any files to the folder, when I changed it to /unifi files and folders showed up in the docekr/Unifi. However I have one more problem. When I start the container and restore the settings from backup everything works fine for a while. I can connect to the controller from the phone and everything works. When I quit the app on phone and reopen the controller on iMac it shows no devices and no clients. It looks like it does not remember the settings. Could you help me please? Homebridge container is running in the docker as well. Great information… Worked for me the very first time… I would however like a little more info on doing upgrades to my controller. How often do you update the links? And does the beta download correspond with Ubiquiti’s beta cycle? The reason I ask is I wanted to try the Beta controller to see what improvements it may contain and was not sure if your download link contained the latest beta code. I don’t link to the beta downloads. I check the versions one in the month and update them if necessary. You can subscribe to the email list, then you will receive a notification when a new version is available. danke für die gute Anleitung (Unifi Controllers/ Synology Nas). Nichtsdestotrotz habe ich ein entscheidendes Problem! Im Docker Container kann man sehen das der Controller funktioniert, aber ein Zugriff auf die Benutzeroberfläche ist nicht möglich. Die Controller Oberfläche öffnet sich nicht, sondern eine Collection Listing die einen Strukturbaum ähnelt. In der „Collection Listing“ befindet sich kein Eintrag hinsichtlich Unifi Controller. Gerne kann ich Ihnen hierzu auch Screenshots zusenden. Vielleicht können sie mir helfen, ich wäre Ihnen dankbar. thanks for the good instructions (Unifi Controllers / Synology Nas). Nevertheless, I have a crucial problem! In the Docker container you can see that the controller is working, but access to the Unifi Controller is not possible. The Unifi Controller does not open, but a collection listing similar to a tree structure. In the “Collection Listing” there is no entry regarding Unifi Controller. I am happy to send you screenshots as well. Maybe you can help me, I would be grateful. Do you have anything else running on your Synology that might be using the same port? You can find my contact details on the about page to send me a screenshot.